We achieve quality standards through performance-based incentives. Project Managers frequently inspect jobsites to ensure conformity to Trumbo Electric’s specifications and the design documents. 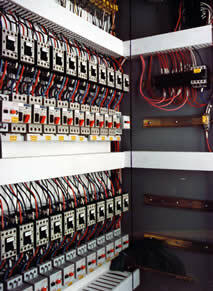 Trumbo Electric is committed to providing a superior product and total customer satisfaction. Trumbo Electric’s warranty provides long term accountability . Trumbo Electric sponsors apprenticeship training and also offers various in-house educational opportunities. Trumbo Electric's unemployment tax rates are among the lowest in Virginia. Low turnover has been achieved by making employees "stakeholders" in company success by offering various performance based financial incentives. These incentives can be a major portion of employee compensation and create enhanced productivity, quality workmanship, and safety. Trumbo Electric offers year round employment and does not use seasonal workers. 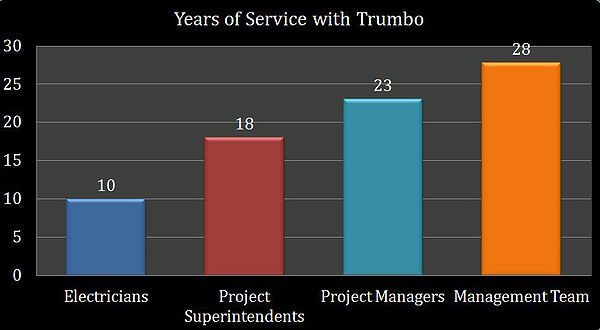 Consequently, many employees have over twenty years of experience with Trumbo Electric.